The E-M10 Mark II - small and lightweight and ergonomically uncompromising, a camera that fits your discerning style and is the perfect companion to take everywhere you go. While featuring impressive metal-body build-quality, the E-M10 Mark II tilts the scales at a mere 390g – so it will never weigh you down on the move. Beautifully built, classic design, it’s right up to date with the latest technologies for the finest images. 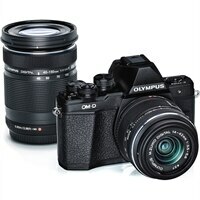 Experience the exceptional resolution and astounding detail captured by the Olympus Micro Four Thirds sensor and advanced image capture technology that rival those of D-SLR cameras. Together with its highly powerful image stabilizer, this technology brings out the very best in each M.ZUIKO lens - delivering awe-inspiring, sharp photos or movies. Try the E-M10 Mark II and be amazed by the image quality! Electronic Viewfinder Even easier image composition: the OLED Electronic Viewfinder boasts an amazing 2.36M dots for ultra-clear image composition of the whole subject plus real-time monitoring of all setting adjustments - all the control and detail you need to get the most out of your photography. Huge Lens Variety An extensive range of superbly built lenses with outstanding optical elements perfectly compliment your E-M10 Mark II in both style and performance. From macro to telephoto to wide angle to fisheye - access to any lens you may ever desire. 4K Time Lapse Use the Time Lapse mode to create a series of images over time which can then be recompiled into a 4K movie where time appears to have been sped up. Create amazing movies with brilliant details - all sorts of subjects including landscapes, nature, urban and industrial scenes and much more lend themselves to the magic of 4K Time Lapse! Slow Motion Boasting multi frame rate movie-making that matches any standard, the E-M10 Mark II gives you super smooth slow-motion playback (4x) - rich in detail for graphic capture of fast-moving subjects. For intuitive focusing control while looking through the viewfinder, you can change the auto focus target to suit your subject by simply using your finger on the touch screen on the rear of the camera. Touch the screen and move the AF point to where you want it and still follow the action through the viewfinder at the same time. The E-M10 Mark II's powerful built-in flash gives you extra flexibility, helping you shoot beautiful images whatever the conditions and travel light with a minimum of gear. Now you can be in the center of the action without being the center of attraction. Silent Shutter mode makes sure the shutter release doesn't make a sound when pressed - for perfectly silent shooting. Shoot beautiful night-time and low-light compositions with the Live Composite mode. Here you can actually see the image build up on the screen as the picture is taken - giving you full freedom of how to expose for low-light static shots.